The saloon incorporates a 32´ large flat screen tv with dvd & an Ipod docking station which you can listen to above and below decks. The Master Suite boasts a full width Stateroom with 2 double berths & ensuite (ensuite head size 50´ wide x 37´ long x 6´6´ high) with a separate vanity wash basin in the Stateroom. The master suite is suitable for 2 adults only. The Guest Suite has twin upper/lower berths & the cabin is ensuite (ensuite head sizes 60´ wide x 50´ long x 6´6´ high). No expense is spared to ensure that Pacific Wave´s guests enjoy a luxury vacation with annually renewed luxury Egyptian cotton bed lines, towels & robes, and Molton Brown toiletries. Lynn was born in Cheshire in West Central England but spent all her free time by the sea in a small coastal town in North Wales. From as early as she can remember she was on the water in some boat or another. Aged 14 she acquired her first 16ft speedboat which was in need of some TLC. Lynn removed all the yellow paint taking the hull back to bare Aluminium and restored it in beautiful Flag Blue. Her father had a successful construction company and as a schoolgirl Lynn kept the books for the family business. This led to a degree in accountancy following which she started a professional career as a Chartered Accountant. Lynn has worked in senior finance positions for some of the World´s biggest Insurer´s, such as Euler International, Endurance Worldwide & Groupama. Based in the City of London she travelled all over Europe and specialised in setting up from scratch new Insurance Companies. After work she loved her TVR sports car and golf. She was also a qualified aerobics instructor and in the evenings after work she taught aerobics for 12 years. For her vacations Lynn loved to travel to the Far East, Middle East, and golf courses all over Florida; always taking to the water wherever possible. Her busy career took her away from her first love of sailing but since 2001 she´s been back on the water qualifying with an ´MCA Master 200 tons´ licence and an ´RYA Commercially Endorsed Yacht Master´ ticket for sailing vessels and has been sailing full time for many years most of the time as Skipper of medium to large yachts. She owned her first yacht in the UK for four years (a lightweight Scandinavian built racer called Temptress) and cruised and raced her extensively up and down the south coast of the UK. She´s raced seriously at regatta´s such as Cowes Week, Cork Week, Antigua Race Week & St Maarten Heineken Regatta. She´s sailed on a 100ft Wally up and down the Caribbean and a large Oyster from Ireland across the Mediterranean to Croatia. Lynn was a Rear Commodore of the Little Ship Club, the oldest sailing club in the City of London. Along with social activities and club cruises she also organised popular weekend racing. She started a winter racing series that encouraged members back onto the water and re-vitalised the club. Lynn has intimate knowledge gained from years of experience of both Caribbean and Mediterranean sailing which includes both island cruising and full on racing. Lynn and Mark met at Antigua Race Week in 2004 and have been sailing ever since. Since purchasing Pacific Wave in June 2008 she has been sailing with Mark full time, travelling up and down the Caribbean every year from Puerto Rico to Trinidad. When not sailing or diving she is a keen golfer and accomplished horsewoman. She has an uncanny ability to find the best anchorages close to the best golf courses and the best stable yards. Marks home county of Dorset in South West England was a good place to grow up and become involved in both sea and farming and, after his partner Lynn, its not surprising that his main passions are sailing and food. Mark´s adventures started early, aged 18 he did his first big sailing trip - 1,300 miles in an old C&N sloop from Lymington on the south coast UK to La Coruna in northern Spain and back. Also at the age of 18, and travelling alone, he walked 5,000 miles from Cape Town South Africa to Cairo Egypt. It took seven months, cost $300, and included being arrested for spying in Uganda. After this and some time running around in the British Army it was a welcome rest to go to college aged 24 and study Agriculture. While there he found enough spare time to become elected President of the Students Union - campaigning tirelessly for cheaper beer. After college he was a shepherd for large flocks of sheep in southern England and then he farmed in south west Portugal, growing vegetables and raising sheep. He was a Royal Bath & West of England scholar, travelling to Australia and New Zealand to study problems with drug resistance in sheep flocks. After 6 years in Portugal he returned first to the Isle of Wight and then Cambridge UK, but travelled all over the world to buy produce and then sell it to UK supermarkets. He spent his free time dinghy sailing and racing at Grafham Water and on the Suffolk coast - and flying. Mark has been an aeroplane pilot for over 20 years and he likes to bring the discipline of flying to his everyday job as a professional sailor. In 2003 Mark returned to the Isle of Wight and went sailing full time but kept his toe in the agricultural water with sweet corn in Hereford and Christmas turkeys in Marlow. He now holds an ´MCA Master 200 tons Unlimited Area´ licence and ´RYA commercially endorsed Ocean Master´ tickets, both for sailing and power vessels. Mark learned to dive age 13 in Malta and then with the British Sub Aqua Club. He dived wherever in the world his work happened to take him and he is a PADI Divemaster. He speaks good Portuguese and gets along well in Spanish and French. Mark´s previous career in agriculture brought him close to food preparation as well as food production and he has worked on road shows with some of the most renowned celebrity Chefs of today. His style is tinged with global influences but mix Southern Mediterranean light cooking with classic cuisine and an intimate knowledge of quality fresh local ingredients. Send us an inquiry to get specific pricing for Pacific Wave. Thank you so much for a perfect week – the best I’ve ever spent sailing! Fantastic food, great seamanship and two of the finest people I’ve met. The Pacific Wave is a beautiful and majestic vessel! We thoroughly enjoyed sailing on her around the magical BVI…. Lynn and Mark were the perfect hosts: they could not have done anything more to make us feel more special and make our stay any more enjoyable. From showing us around idyllic islands and underwater shipwrecks, to letting us take the helm and then sampling Mark’s culinary masterpieces… we loved every moment onboard the Pacific Wave and have made memorable, unforgettable memories! “Una luna di miele da sogno! Una scenografia perfetta: acqua turchese, sabbia morbida e bianca come borotalco, pellicani che ci accompagnano in viaggio mantre il vento tiepido spinge le vele del nostro yacht da sago verso la prossima isola idiliace…. Lynn e mark ci hanro coccolati durante tutta la settimana, facendoci sentire speciali, accomodando agri nostra richiesia e personalizzando il nostro viaggio secondo le nostre necessita. The boat is beautiful. We knew we had picked the right one when people on other yachts came by just to photograph us. The cuisine was just the right mix for our active family – clean, fresh, healthy and delicious. The kids ate fish and loved it – they never eat fish! And l know I’ll ever be able to even poach eggs to the standard they’ve now become used to. Lunches were light but filling, and dinners well presented and tasty without being unnecessarily fancy. Good job chef! The BVI was beautiful, even though things looked a little mashed up in places. We enjoyed snorkelling and your expert guidance on where to go and what we might see made it extra special. A few words cannot do justice to the great times we had aboard Pacific Wave. However, in an attempt to do so… thank you for a great, fantastic, wonderful & relaxing time during our honeymoon week! The food and the drink were on par, if not better than Michelin 3 stars. The rum punch is the best on the islands. We enjoyed being on a true, gorgeous sailboat & your handling of her. You both knew the best places to go both above and below the water. The turtles were the highlight of Brooke’s time snorkeling, and Lynn’s knowledge of the local marine life was outstanding. What a fabulous week! We could not have asked for two more experienced and knowledgeable pairs of hands to charter us through the British Virgin Islands. And what a comfortable and well appointed boat to do it in we had no idea our accommodations would be so luxurious! We loved all the quiet anchorages off the beaten track that you took us to. We all enjoyed boating and swimming off the boat. The kids learned to snorkel and kayak and are all quite pleased they got to drive the dinghy. And as we said every day, the food was amazing! The meals far surpassed our expectations and were graciously served every time. The kids told us that we need to bump it up when we get home! 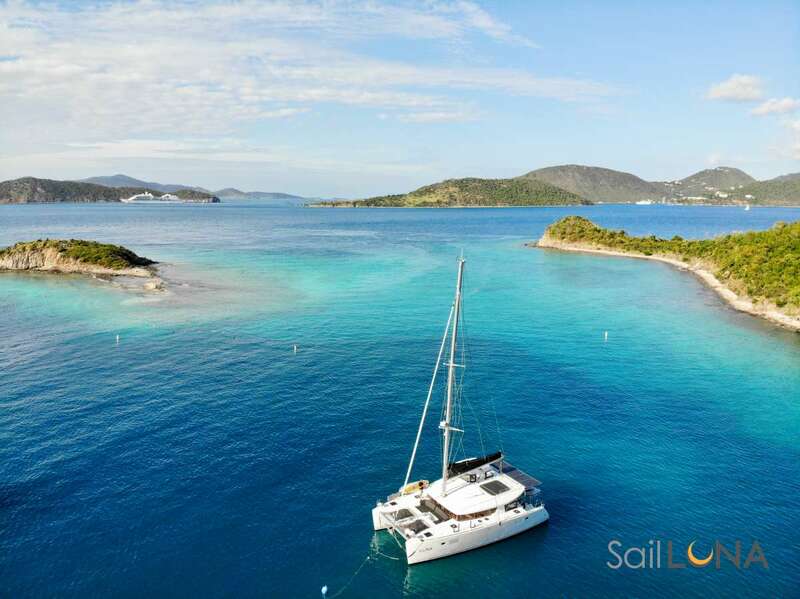 Gary has been talking about sailing in the BVI for some 25+ years and we will now all have our own memories of crystal blue water, white sand beaches, sunny skies and wind in your face as you sail across the waters. Thank you for helping to make this a wonderful and memorable experience for our family! Thank you so much for the wonderful trip! Its not easy keeping 2 adults and 3 teenage boys happy but you did it! ☺ We had great weather and had great sails and fabulous snorkeling. Saw so many cool fish l cant even begin to list. And Mark prepared delicious meals everyday, which we ate hungrily after our snorkeling adventures. A great experience had by all! This was one of my favourite trips. My favourite part was the spotted eagle ray. It was about 6 feet long but a gentle giant. It was so pretty and it went in circles around me for 10 mins. We cannot thank you enough for sharing the Pacific Wave with Todd & me what a wonderful, much needed, relaxing time for us! You are both such gracious hosts! The food & drinks were wonderful & we appreciated learning more about the history of the islands. We cannot wait to share our memories back home with family & friends!!! What an adventure on the Pacific Wave sailboat! Our hosts were so gracious, they described the different islands with an historical flair and always chose the best snorkelling spots. It was amazing to sail the Sir Francis Drake Channel and moor in an isolated, hidden away sheltered bay. It always felt like l was with trusted seaworthy people who had mastered finding the wind and sharing their passion for sailing. Our meals were delicious and a great time to be merry and relax in such a beautiful setting. great sunsets and turquoise seas. This trip definitely built wonderful memories of sky, wind, sun and sea. Thanks so much for a wonderful week. We had a great time: some excellent sailing, some spectacular snorkelling, and lovely food. We hope that Marks book goes well. Thank you very much for a wonderful week. Cant wait to go back home and show everyone all the photos of the things we have seen here. You guys have a pretty good setup! Our week with you was amazing. This was one of my bucket list, and the first big trip (many more to come) for Cindia and me. The beauty, the soft winds, the amazing dinners and lunches, and (gasp) breakfast you served were great! Now for 2 months of dieting. We hoped to have good diving, and you arranged a special and more expensive outfit, that was just great! Cindia and l loved our diving, so beautiful. Your kindness, warmth and good humour were just incredible. Thank you so much for a fabulous week! Thank you very much for this great voyage! We finally had a chance to visit the BVI and experience our first proper sailing trip. Our girls love it very much so were all very very happy! For our family of five, we all agree that we would stay another week on the yacht if we could! We had an amazing week on the Pacific Wave! The snorkelling was the best weve ever seen. The dinghy pickup service on our snorkelling outings was first class! Lynns knowledge of the BVIs is book-worthy; start writing Mark! We had a lovely vacation and made memories to last a lifetime. The food was the best in the BVIs! Mark is a master in that tiny little kitchen & Lynn is a gracious host, even when we spill the pitcher of milk ☺. Thank you for an amazing vacation we did not have our sea-legs prior to boarding the Pacific Wave. Now, we are salty sea dogs and are sad our sail has come to an end. Please put a visit to Washington State on your list of things to do! Thank you for your kindness and for sharing this adventure with us! Well come back again. Let us know if you ever need any deck hands weve got 3 willing boys! Just need to feed them! Hospitality was amazing thank you both! We had a very nice family vacation week with our 3 boys. It was their first time sailing on a boat this size and Pacific Wave is a lovely boat. Thank you to Lynn & Mark for the experience. Great recommendations for snorkel and anchor spots and really good knowledge of the BVI. Thank you for a great week full of snorkeling & sailing. We enjoyed your cuisine & conversation. Next time you are near Maine or New York City let us know. What a wonderful escape you provided from New York winter doldrums and the pressures of work and responsibility. Well return to our world refreshed ready to carry on!!! Thanks for taking such great care of us, guiding us through the BVIs, feeding us, ligating us, and ensuring we had a wonderfully relaxing respite. We thoroughly enjoyed our short week on Pacific Wave. Thank you for hosting us for a truly fabulous and memorable time. What a week! You have spoiled us rotten the sails, the seas, the food, the laughs we couldnt have asked for a better way to sail into 2016 thank you! Your knowledge and expertise of sailing and all of the secret spots and coves in the BVIs made for a wonderful week. We loved stargazing with that alien machine we will surely be talking about that device for years. We were honoured to have had the chance to read excerpts from Marks book what an incredible adventure! We look forward to reading it in print someday soon!! Our second cruise on the beautiful Pacific Wave & every bit as good as the first cruise, if not better! Its hard to find words to express how you have both made this holiday just amazing. We have spent an amazing week in paradise cruising around the Caribbean Islands of Martinique, Dominica & Guadeloupe. The crews local knowledge was excellent, they knew exactly where to take us on each island & it was such a treat for us to explore these new destinations. Weve enjoyed a week filled with great company, fantastic cuisine, lots of fun & great sailing on the beautiful yacht Pacific Wave. Chartering Pacific Wave has been awesome & we cant wait to return. Thank you for a wonderful & soggy adventure. We have wanted to visit the Grenadines for a long time and were so very happy to have had you show us the sights. Such a great trip with a terrific Captain & Chef. Thank you for a great vacation aboard the Pacific Wave. I could not imagine a better way to spend my 40th Birthday! We cant wait to be back aboard, perhaps in the BVIs next time. Thank you again for the wonderful week. It takes a special crew to make a week in the BVIs special to our 89year old father. We cannot thank you enough for your patience throughout the week with an elderly old salt. My father was most impressed with Lynns sailing skills. To quote shes a hell of a skipper! Mark of course made his mark in our memory as a laid-back chef of considerable talent. To sum up, there would be no other vessel other than the Pacific Wave that could have made our time in the BVIs as special as it was. Furthermore, my fathers time in the BVIs (1950s, 1960s, 1970s) was the reason we took the trip. His happiness for returning one more time cannot be overstated! Thanks to you both for an incredible experience. Ditto to my bros comments! Lynn & Mark were the perfect fit for us. Could not have been better at making sure 89 year old dad felt at ease! Loved your local knowledge and insight into the islands and creatures that live here! Such special memories for all 4 of us. This has been a dream come true for my dad. To be sailing these islands with his 3 kids. Lynn & Mark are superb hosts. Their knowledge of the island, local flora & fauna and stories of their years of cruising these waters made each day a new and interesting experience. Not easy to sail with such an old croc (as my dad calls himself) but they were patient, gracious and attentive. Truly an experience to be treasured! Thank you for taking us to be splashed by the waves on the beach. I had such a fun time! 7 - 16 February 2015 - USVI/BVI 2 Couples 50th & 60th Birthdays! We had such a fabulous time. We loved all the places we visited and people we met. AnnaMarie & Jimmy had the trip of a lifetime!! They thank you for the great experience. Peter enjoyed his birthday and will always remember your hospitality. Mark the food was OUTSTANDING! Our third cruise aboard Pacific Wave and we cant wait to return again soon! Fab food, great hospitality all aboard the beautiful Pacific Wave. This is the best holiday weve ever had! We are so grateful for this wonderful vacation, your kindness, generosity, warmth & humour which will never be forgotten. Memories etched in our minds beautiful sailing, gorgeous weather, Marks delicious cooking (and hysterical stories!) Just perfect! The Duprees wish you both a fantastic New Year 2015 filled with love, health, gorgeous weather & of course, happiness. Thank you for this amazing experience. Thanks so much for an incredible week aboard Pacific Wave and a fabulous Xmas we wont forget, the Christmas Crackers, Xmas Pudding & Harrods Xmas Cake were great! Carolyn & Alexandra had a terrific time diving, thanks for making it all happen including a Xmas morning dive! Mark, its amazing what you can do in the galley, the food was outstanding, your hospitality has been great, weve had such a wonderful time sailing with you. and thank you for organizing Sir Richard Bransons sail by. you have some pull! Before long, we will be sitting in front of our fireplace at home, warming ourselves with memories of our time with you in the BVIs. Ken, Carolyn, Alexandra & Janie! Thank you so much for making Christmas 2014 so memorable for us! It has been fantastic for us to be aboard Pacific Wave. You have made it a wonderful experience and it has been great getting to know you. Merry Christmas and all the best for a great 2015! PS Come visit us in Canada if you get tired of Paradise! Very seldom do things go exactly as planned, almost never do things exceed expectations. this week was one of those times. The snorkelling was spectacular the sails were exciting, and above all, the company with Lynn and Mark seeing to our every need made this a wonderful week. Sadly now back to Philadelphia cold and dreary as it is this time of year but with warm memories with new friends in Mark & Lynn to keep the memories alive. See you again. Many thanks for a wonderful trip & celebration of Charles 70th. We loved all aspects & TLC you both provided. The boat is exactly what wed hoped for & we are delighted to have found you. The food was incredible, your detailed knowledge of all the best spots was invaluable, & appreciated by all. This has been a great success many thanks! I couldnt think of a better way to spend our honeymoon! Im so happy Aaron found you!! We both absolutely loved all the meals onboard (I cant believe all those yummy dishes came out of Pacific Waves Galley! There is no excuse for me at home now), and the explorations to new islands everyday. Neither of us had been to the BVIs before, but now we will definitely come back. Thank you for your wonderful hospitality, your stories, and your willingness to teach us about sailing whenever we asked. We will always remember this trip with such great memories. Thank you! This last week has been amazing! We have gone from tense to perfectly relaxed. Our skin from white to pink to tan and our livers pickled with Pacific Wave Rum Punch! Thank you for having us aboard Pacific Wave and providing us with new memories and a wonderful vacation! Well miss you, keep in touch and hope to see you next year! What a wonderful time you have given us over the past week perfect sailing delicious meals and attention to every detail. Pacific Wave is so beautiful and it is has been a total pleasure being on her. Thank you for all your hard work these past ten days. You both went the extra mile to look after us by providing us with everything we needed, including obtaining a pigstick so we could fly the Royal Yacht Squadron pendant. The meals were delicious and the culinary creativity of Mark never ceased to amaze us. It truly does not get any better than this! Beautiful boat, amazing crew and perfect weather - all in one of the prettiest places on the Planet. Thanks for taking such good care of us and seeing to our every wish and need. We are now relaxed, refreshed and re-energized ready to tackle the world again. Thanks for an amazing week that passed far to quickly! What an incredible experience you have given us sailing in the BVI on your beautiful PACIFIC WAVE. I cannot begin to express my gratitude. You make such a good team the sailing, the accommodation, attention, THE FOOD, information about the area, etc., etc., etc. We loved the snorkelling, swimming, hiking, and watching the Super Yachts. Thank you for making all the arrangements off the boat as well. Every detail was covered. This has been a special week ..
A dream vacation will return again. Thanks for a wonderful week of sailing & exploring the BVIs! Your knowledge & advice on travel options was superb. The food was amazing & the service was thoughtful & gracious. As bare-boaters for many years, your excellent service will make it hard to go back to DIY again. I admired your stealthy ways of attending to the many details of sailing while leaving your guests undisturbed. Bravo! We hope to be back again. You guys are AWESOME!! Thanks for the recipes Mark we will think of you fondly when we try to recreate your masterpieces! You know what??? We are happy . Why??? We thought we knew the BVIs, and a little about sailing but, but. We discover so many unknown places, new snorkelling spots and all that aboard an elegant sailing yacht. And more the comfort onboard SY Pacific Wave is top level Five Star ***** due to the permanent work of Lynn & Mark. So .. everything is working perfectly onboard, sailing, comfort, anchoring choices. More again . Lynn & Mark always smiling, always taking care of us, and permanently ahead of our wishes. About the food now, we think unbelievable to find on a sailing yacht such a top level excellent cook. Mark has got a secret its the smile of Captain Lynn of course. Thank you, LYNN, MARK & PACIFIC WAVE no end of dreams! We would like to thank Lynn & Mark for a wonderful week aboard Pacific Wave. As committed motor boaters they have ensured our first foray into the world of sailing has been both informative and enjoyable but most importantly, great fun! The food served on board has been excellent due to Marks skill in the galley, and Lynns attentive service has ensured we were very well catered for. The first time l saw Pacific Wave on the Website l thought that is THE ONE! The boat is even better than l imagined and you both have made us so very welcome. The food, the snorkelling, the cocktails heaven. Thank you for making our BVI dream trip even dreamier! What a joy to be welcomed by a dolphin and then be in the aquatic company of so many new and beautiful fish. Masterful sailors, chefs and super yacht informers. Heres to an adventurous and sparkling 2014! It is with heavy hearts that well step back on land from off the magical Pacific Wave. Lynn & Mark you did a fantastic job of looking after us all, responding to the hundreds of daily requests from our motley crew and making us feel so comfortable and welcome on your beautiful yacht. Rest assured we wont hesitate in recommending this fine vessel to ALL of our friends looking to sail The BVIs. We hope you have a fabulous 2014. For delivering such an unforgettable experience in the British Virgin Islands! You guys are super organised. You work together as an amazing team with seamless ease, whether it be sailing the Pacific Wave, producing the most amazing meals with the panache of a 5 star chef to identifying what we wanted in our time on this fantastic yacht. Your incredible friendliness has been the icing on the cake. No amount of research could have found the fabulous spots that your intimate knowledge of the Islands could. from snorkelling off Mosquito Island to super swanky cocktail bars and off the beaten track eateries with breath taking views. Its been an absolute joy that we have been lucky enough to share your stunning yacht this week, and, whats more, l think you may have sparked an interest to start sailing as a hobby!!! ´We had an amazing time and Pacific Wave was the highlight of the trip! Thank you so much for sorting it out. I left the day as a complete surprise for Colin and he was completely gobsmacked when he saw Pacific Wave. The day was perfect and Lynn and Mark let Colin sail us to Peter Island which he loved every minute of. The food was outstanding 5 star restaurant standard. We also had a snorkel with Lynn and she was so knowledgeable about all of the different types of coral and fish. I was thoroughly impressed with how professional but very friendly Lynn and Mark were, they made us feel at home. They have a beautiful yacht with all of the little touches of a 5 star hotel. I cant thank them enough, they made a lovely holiday a very special holiday indeed. What a fantastic trip! Highlights were three fantastic dives off the Dogs and Tip o Scrub. We saw turtles, a shark, eels, and a deep cave. The spa at Peter Island was incredible! Loved the Bitter End as well. Lynn & Mark we loved it all, great laughs and great food! Mark you are now an expert at Canadian drinks. We so appreciate your kindness. It is apparent that you sincerely want your guests to have a world-class vacation, and we have! You make it look easy: sailing, cooking, and taking care of our every need all the while. We felt so proud to re-board the most beautiful sailboat Pacific Wave. We have enjoyed getting to know you both. Thank you for your lovely hospitality. You are an amazing couple with a beautiful yacht. We wish you the very best. It is hard to find words to express how you have both made this holiday just amazing! It has only been a dream to come to Paradise. Bless you both for making this amazing dream come true. You have both helped us make memories that would not of been possible without you. It would be totally awesome to have you both come to Perth, whenever you are free. Thank you Captain Lynn & First Mate Mark. Thank you for making this a wonderful vacation for us. Your beautiful boat and hospitality was a great way to enjoy our family vacation. Your Samurai Cook Look and results will top the Jamie Oliver craze. Come and see us in Austria and we will cook for you. Vince emailed me with the following glowing report about his charter with you (below in italic). You obviously did an over-the-top job to make this ´the best vacation of their lives´! It´s been an absolute pleasure working with you and I´ll try and send some further business your way soon. ´It was the best vacation of our lives! It was the best sailing we have ever done and we have sailed all over the world. I have been sailing for 53 years and my wife for 35 years. We took turns day by day and did most of the sailing. We covered a hundred miles. My wife and l have been sailors all our lives. This is the best sailing we have ever done. The boat is awesome. The weather was fantastic. Every meal on Pacific Wave was perfect. Lynn & Mark are top notch sailors. Probably the best owner operator team we know of for chartering. I have sailed all over the US, Europe, Hawaii and off western Canada, but my wife, Jan and l like the BVI the best so far. This was such a great experience it convinced us to buy a new boat ourselves. Thank you for sharing your very special yacht with us. We had a lovely experience getting to know the beautiful BVI on Pacific Wave. The Rhone was a dive we will never forget! Best wishes for fair winds & a million bubbles on your dives! Thank you for a wonderful adventure. Lots of new experiences above & below the water line. The Canucks will definitely return to the BVIs some day. All the best. PS Thanks Mark for the meals, the snorkelling & the drinks together onboard. Thanks. I look forward to sending more of our clients to cruise with you. What a fabulous week of experiencing the BVI onboard Pacific Wave! We came having had all the resort experiences, and were hoping to have a different kind of vacation, and l can truly say our expectations were exceeded. The two of you made our stay so comfortable, with the fabulous food (thanks Mark), the great accommodation, and all the fun activities. As a family, the chance to spend time together in such beautiful surroundings, without the distraction of home, has been a gift. I know the snorkelling that the boys did will be something they will remember forever and Shane will certainly relish being rummy champ! For Wendy & Myself, l think being able to sit and enjoy the solitude and surroundings of all the great anchorages was a highlight, and an inspiration to get even more out of our motor boat at home! Thanks Lynn for going horseback riding with Wendy, a trip would not be complete without a hack! Maybe next time we will play golf instead though! Most of all thanks for making us feel so welcome onboard Pacific Wave, & for sharing your knowledge and experiences with us. Hope to see you up our way in Long Island Sound! An amazing week and a half sailing the BVI. The food is amazing probably the best chef in the BVI is on the Pacific Wave. But also the willingness to entertain two beach bums trawling the bars of the BVI. Brilliant to sail such a beautiful big boat with all the other boats taking pictures. Thanks Mark for teaching me to snorkel. Mel has done some of her best diving on the Rhone with Lynn. Dont want to get off. You have given us the most wonderful holiday, complete perfection in all we were spoilt with, the best boat to be privileged to be on the attention to our care, and enjoyment has been 2nd to none. The best gourmet food we have ever had. So many memories to cherish! This comes to thank you most sincerely with love and good luck always. We echo all that Julia has said. It has been an unforgettable week full of treats the way you have looked after and FED us has been unbeatable. THANK you for it all not least the interesting stories about the Caribbean! Can we take Mark and his cooking & Lynn and Pacific Wave home to Berwickshire to sit on the Tweed? Contrary to reports Scotland is boiling hot all the time and were sure you will be blissful! It has been an INCREDIBLE couple of weeks, thank you both so much. We feel like different people heading home and are so lucky to have had you both looking after us. You are complete stars. Hopefully (very much) this wont be the last time we see you. Just wanted to say this is absolutely the best holiday we´ve ever had... and we´ve had plenty! And not to be forgotten, all the Pacific Wave Rum Punches!!!! Our first experience on Pacific Wave 2 years ago was so superb its hard to believe it could be bettered. but this week has been perfect. We all feel totally spoiled by our two very gracious hosts, nothing overlooked or too much trouble. Thank you both for a magnificent experience! Thank you so much for sharing your yacht with us. We have had an incredible week onboard Pacific Wave; she is absolutely beautiful! Mark, we cannot believe how you can produce such fabulous cuisine in such a tiny kitchen! Every meal was superb. Lynn, you really made us all feel at home. Your knowledge of the USVI and BVI is truly remarkable. Thank you both for this enjoyable week. We will never forget it! What wonderful memories you have made for our family and our friends. Thank you for opening your yacht to us and sharing all the wonders of the BVIs. Should you visit Florida, USA in the future, we would love to have you as our guest!. Safe travels. What a fantastic week. Sun, wind, and a little rain one day made the sailing interesting and all the activities in between kept us busy while not under sail of course. I cant not mention the food which was way above expectations (i.e. unbelievably good) and on offer around the clock! Needless to say, the next outing on the Solent will only serve to highlight how special the BVI, Pacific Wave and her crew/owners are. This was a fantastic week! The weather was amazing and the mood was perfect. Between waterskiing with Mark and wondering around Peter Island this was an extremely and unbelievably fun experience. A great week in celebration of my 50th Birthday. I didnt actually think Id live this long, so this is just icing on the cake. Good friends, great crew, fantastic food and beautiful destinations combine to make this a truly memorable week. Thanks to Mark and Lynn for your gracious hospitality, gentle demeanour and tolerance of our lack of temperance. Thank you for everything! Everything we had hoped to experience and so much more! The Pacific Wave was perfect for our family of five, elegant, cosy, peaceful to the extreme. You read our minds as to what we wanted to do each day, including nothing at all. Thank you for sharing your wonderful craft with us, for your easy humour, and great care. Sophie thanks you for answering an un-ending stream of questions about everything. Every meal was a treat, how you keep out doing yourself l will never know. We cant endorse you more highly. You guys have made my week so fantastic! I love how l got to stay with you while the others went diving. I hope that l can come back to PACIFIC WAVE!! Mark l loved your cooking! You have been spoiling us all along!!! You are very kind and nice! Lynn You are a great Captain! I loved snorkelling with you! You have been extremely great! You guys are the most enjoyable people in the world! I will really miss you! -	Lynn snorkelling with Nina and teaching her about fish, coral, sea cucumbers & more . -	Hollie, Ren and David becoming certified Padi Divers! Most of all we will remember your amazing hospitality! Thank you Lynn & Mark for the most memorable week, we hope to do it again. Until then if you find yourselves in Kansas City, your KC family looks forward to repaying your amazing hospitality! Thank you so much for making our honeymoon the most amazing time. We will look back on our week with you, each and every year, with such fond memories. Lynn you are truly a great sailor. Thanks so much for teaching Ash as much as you could in a week and for encouraging me to take the helm! We will also go away with great memories of your Pacific Wave cocktail! Mark, you amaze me! The meals you can create in a yachts galley is a feat that not many could do! The food has been exquisite in taste and presentation. You have inspired me to learn to make homemade pasta! That will be one of my culinary challenges for 2012. The knowledge you both possess on the BVI adds so much to your guests cruise. Knowing the best places to go, see, eat etc., dependant on a guests needs is invaluable. I definitely think this is the most relaxed l have every left a holiday and its all thanks to you both. You are such wonderful people who took wonderful care of us. Thank you so much for sharing Pacific Wave with us. Thank you for a fun week of sailing! We very much enjoyed sailing and visiting the islands. Your knowledge of the islands and beaches was very helpful. Thanks to Mark for all the meals. The menu was fresh, creative and delicious! Thanks for sharing Pacific Wave, she is a beautiful vessel. We had a great week and appreciate your hard work. Wishing you fair winds and friendly seas! Boy time flies while youre having fun, we had a blast as this week flew by! Mark & Lynn you made us feel comfortable from the very first day we stepped onboard Pacific Wave. We enjoyed our relaxed dining experience with fantastic gourmet meals. We loved the snorkelling and perhaps in the next few years well progress to diving. Thank you Lynn & Mark for your excellent knowledge both on land, at sea and under the water. I cannot believe how much fun we have had! We had a great week because we felt secure with your professionalism and at ease with your hospitality. Hope to see you again soon. What a fantastic week! Thank you so much for a wonderful time. You two have truly made our experience in the BVI what it was. Pacific Wave is such a beautiful boat with lovely accommodations. It was all the best: scuba diving on Christmas Eve; snorkelling on Boxing Day; introducing us to Ting (we have to figure out how to import it to the US); sailing in glorious trade winds yet still seeming to find us a hidden protected cove each night. And the food! Thanks so much for a great Christmas we only hope Richard Branson can join us next time. Thanksgiving will forever in the future (particularly the meal) be a less exciting holiday! Excellent itinerary, to be repeated soon! After a close encounter with the local night life we set sail for a relaxing week with Pacific Wave. The days drifted by blissfully fuelled by a plentiful supply of rum punches and a five star menu executed to perfection by samuria chef supreme Mark. Weather perfect, turtles friendly, scuba & snorkel most successful a great vacation onboard Pacific Wave. Thank you! For a pregnant women to start her entry in the guest book raving about the food may be a bit clichd. but with food like this.! We started off the week with Marks Dorado Stacks, sailed through every starter and entre sent up the stairs and demolished the most amazing Thanksgiving spread! I and everyone onboard enjoyed every bite and will try our hand at the Dorado Stacks back at home thanks to the Dining on Deck Cookbook which features Marks recipe. During the occasional non-eating moment, this pregnant woman even took the wheel under Lynns supreme guidance. Thank you both Lynn & Mark for a spectacular week, next time well rig up the playpen in the dinghy! Our vacation onboard Pacific Wave started with a bang! An aggressive drinking night at the Fat Turtle (in Yacht Haven Grande, St. Thomas) followed by a week of well needed relaxing on the open seas. Caribbean Thanksgiving might be the only way to do it! Thank you Mark & Lynn for an unforgettable Holiday! Thank you so much for such a lovely trip! The food was delicious, the service was fabulous, and we are leaving you tanned, rested and relaxed! Youve set the bar pretty high for our newly-married life we expect smooth sailing forever! We had such fun watching the epic battles between the pelicans and the tarpon, diving the RMS Rhone, and eating that delicious vegetable terrine! Thank you again for giving us such a wonderful start to our honeymoon! The past week has been what us Paddies call the craic! . Great times, great food, great laughs and a great adventure! Never in the entire history of navigation have two land-lubbers been more saddened by hearing land ahoy on the day of their departure! See you both soon we hope, (whether UK, West Coast of Eire or back here). Bon voyage, safe trip, god bless you both and all who sail with you. Thank you so much for the loveliest week ever! Just stepping on the boat from a long plane ride, and immediately being swept up and away to the most beautiful islands, was an experience that we will always remember and cherish! Great food, charming company, lots of laughs and contented sighs. What a miraculous week! Thank you so very much! Happy 50th Birthday to Wendy! Mary and Peter, Howie and the Birthday girl arrive onboard the Pacific Wave! Lynn and Mark so friendly and welcoming! Pacific Wave Grog, naps, and wonderful food! Such a nice time, such special friends! How lucky we are to have such friends! Heres to many more birthdays! Wow! that was the shortest week ever! It was just a week ago when l boarded your beautiful yacht to celebrate my big 50th shhh!!! Birthday. The days have gone quickly as each day was filled with delightful fun memories. Loved all the stories of places we visited, loved the amazing yummy meals eggplant stacks, tamarind chicken, the bacon, Howies English breakfast, most especially the Grog forever to be known as a Pacific Wave at my house! The turtles, the rays, my huge sand dollar were all fantastic, but the best part of the trip for me was spending time with dear old friends and meeting two special new ones. Good luck with all your ventures and travels and l hope to be with you again soon! After ringing the bell for having you place the most dinner reservations at the most restaurants for the same date in the most different countries, our cruise in the BVI with some of our intended guests was crack on! Thank you. From Sopers to Norman, to Peter, to Marina Cay via Guana, Mosquito and Biras Creek, to Anegada for Lobsters and Grog and return, to Marina Cay via Leverick Bay and Great Dog, you spoiled us with fine cruising, good food, and a hell of a lot of fun! We will join you again, and please sail with us aboard the next SY True. Should you find yourselves in New England (Boston/Newport) or New York. Please look us up. On behalf of the grown-ups... thank you for EVERYTHING! We felt special and spoiled the entire week. The anchorages were perfect many were new to us in spite of several other bareboat charters in the BVI. The boat is special and gorgeous. And the food was beyond our wildest dreams. For all of us (kids too), some highlights are: Averys first water ski, Wreck of the Rhone by snorkel!, Seeing one (or more) sea turtles each day, The sail from White Bay to Sopers Hole, Our private beach on Mosquito Island, Keeping us away from the bad fish, Our night out together at Biras Creek & Saba Rock, Beatrix sleeping under the stars!, Isabels love of kayaking and starchy food ... swimming around the boat, Getting to know you both a little and swapping tales Thanks for the passage! We hope that youll come North. It would be our pleasure to host you - and show you around land or/sea in Rhode Island or Weston MA. Fondly. We leave you rested and full of memories to keep for a lifetime! From the moment we stepped aboard until our day of departure you made us feel so welcome and comfortable, attending to our every need. Thank you for allowing John to share the helm (he was in his glory), for filling us with your amazing meals, and showing us the beauty of both the US & British Virgin Islands. It was such a pleasure to get to know both of you, and we thank you for sharing Pacific Wave with all of us. If you ever bring Pacific Wave to Nantucket please let us know perhaps we can return a bit of your wonderful hospitality. Dear Lynn & Mark This has been the best sailing trip Ive ever been on, (it has been since its the first), but Im sure it will be the best if l go on more. Thank you! ´Sailing on Pacific Wave has been a relaxing, fun time. I have to admit that l approached this adventure with a bit of trepidation would l be able to enjoy the voyage while worrying about mal de mer. Knowing that l had lots of support eased my concerns. You all were terrific. Your knowledge of the boat and the area helped me relax. Wonderful food, comfortable accommodation, and most of all, great company created lovely, memorable times. Merci. Lynn & Mark Barbara & l thoroughly enjoyed this 7 day sail. You both were just wonderful sailing skills, attention to your guests & lovely personalities. We so appreciate your professionalism, friendship, attention to every need, wonderful meals, and a fine horses neck (Dark & Stormy). Thank you. We recommend you highly, had a wonderful time and are grateful for your great hosting ∩taincy. Thank you. Dear Lynn & Mark We have spent years bareboat chartering. What a pleasure it has been having you to plan our day sails with us, and providing such wonderful meals. It has been a spectacular voyage. OK many superlatives have come your way from our entire crew. They are well deserved. But let me add what might be a unique thought. Pacific Wave and its crew created an atmosphere where three couples, friends but not yet comrades, turned the corner and developed feelings for each other that are deeper, richer and more enduring. What a gift we received from each other. The sun, the ocean, & Pacific Wave were essential. The two of you provided the ingredients to work the magic, thank you both. the future you deserve, and send you our love and gratitude. Thanks so much for welcoming the Heher gang onto Pacific Wave for such a wonderful cruise from St Thomas to Virgin Gorda and back. Highlights were many, too many to list, but here are some: Fabulous Captain(s) & Chef/Crew a great team! -Upwind trip from Cooper Island to Virgin Gorda - Run from Virgin Gorda to Peter Island - Great snorkeling & tubing - The Coffee Grinders - Calm, unique anchorages - The Shark (Tarpon in disguise) in Francis Bay - The Barracuda at Christmas Cove - The Sting Rays at Norman Island Eggs (Poached), Tamarind & Lime Chicken, Summer Fruit Compote, Garlic & Tomato Shrimp, Salads & Salad Dressing. Everything served was delicious, nutritious and fresh, and in exactly the right portions. Thank you so much for making this our BEST VACATION If youre ever inclined to visit New England, well be offended if you dont call us. We could even visit Newport RI and look at sail boats! We had a splendid time. Circum-navigating Tortola, we snorkeled, swam, water-skied, ate (amazing food), and sailed! Gorgeous! Absolutely beautiful boat and the most wonderful, capable, friendly captain and mate! Thank you!! What was more fun? Wakeboarding around Le Chiffres mega yacht, the divine poached eggs and bacon or seeing the genoa unfurl on the passage from Sopers Hole to Norman Island? Getting the balance between looking after your guests and bothering them and letting them have a go at sailing and being in control is a fine art which you do really well! Also had an excellent time! I loved wakeboarding, being under full sail and seeing the dolphins! Eight fabulous days aboard Pacific Wave, thank you Lynn and Mark. Very unfortunate that some of our party were forced to depart early, but all the more reason to come back again soon. The meals were outstanding and the islands and snorkeling just gorgeous. Pacific Wave is unsurpassed! Our second voyage on Pacific Wave, this time with the three kids. A magical trip again. You showed us beautiful scenery, stunning anchorages, wonderful times. And ... the kids loved it! I have rarely seen them engaged to this extent. Thanks again for your hard work and companionship. We always feel safe with you guys. Great trip, everything was wonderful, thank you! Good times, lots of laughs, enjoyed the Forests (Pacific Wave special rum punches), all our meals, snorkeling, etc. Willie Ts quite the show ha ha! Happy Birthday me and Mark! (Christine celebrated her birthday onboard, the same day as Mark celebrated his). Enjoy! You all gave us a great and memorable week aboard Pacific Wave. She is a beautiful, seaworthy boat and sails magnificently, a rare combination. Our sail to Nevis, Monserrat, Guadeloupe & Iles des Saintes was tremendous fun. You all looked after us wonderfully and worked so hard in some fairly lumpy seas. Marks work both above and below decks amazed us. Out one minute working the boat, the next producing terrific meals. We have both sailed all our lives and therefore really appreciate the hard work you put into making our week with you special.